The 8 Laws of Health are the foundation of Naturopathy. It will be the basis of how I instruct you on raising your puppy and care throughout his or her life. 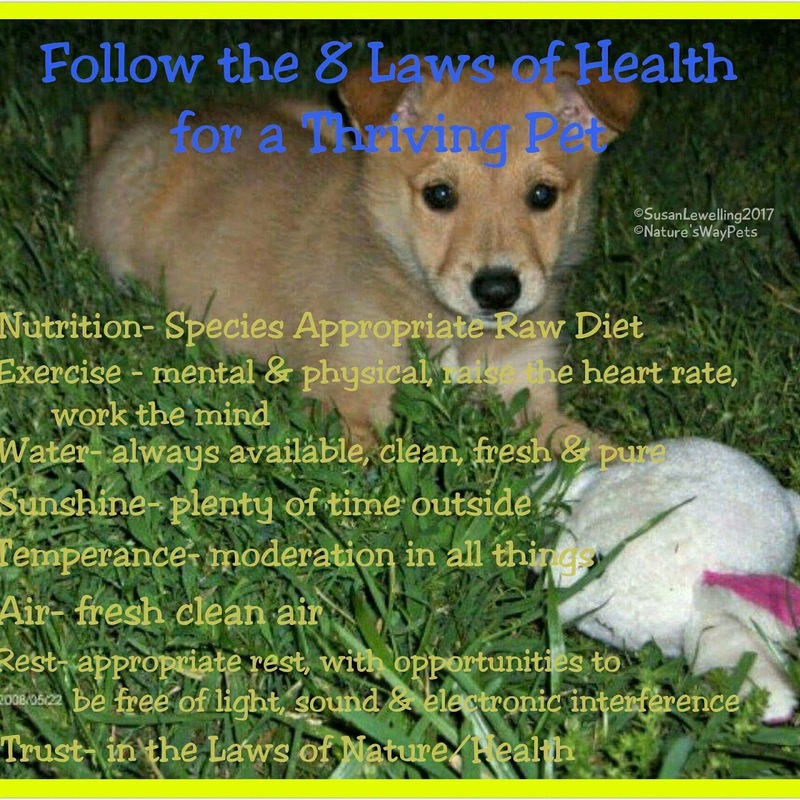 Therefore, I wanted to give you a little primer on what these laws are and how they apply to NR(Natural Rearing) puppy rearing. Before we begin, know that your dog is more than just a physical body, she is a whole being consisting of mind, body and spirit. These laws apply equally to the whole dog. Conventional veterinary medicine (and human medicine) only address the physical with suppression of symptoms through medication and surgery. Natural Rearing is a wholistic paradigm where we practice prevention, allowing the dog to be healthy by following these laws of health and address challenges by looking at the whole being, and supporting the dog through natural methods to overcome the challenge. Nutrition is first, as it it the foundation of all health. Without Species Appropriate nutrition the body can never thrive to its full potential. For dogs this means a diet of raw meat, bones and organs. It is only in the past one hundred years or so that "dog food" has become kibble. The kibble companies have convinced the public that it is appropriate and complete nutrition that our dogs cannot survive without. 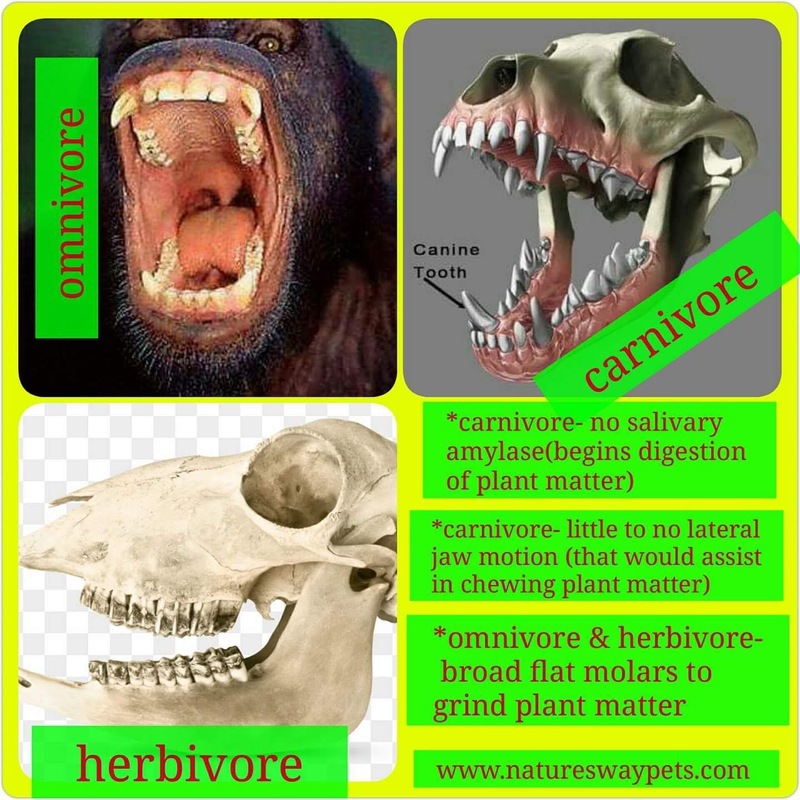 They have even taken over the nutrition classes in veterinary colleges, leaving the vast majority of our vets without proper nutritional knowledge. All we need to know to feed our dogs properly is taught to us by nature and history. Our dogs have a drive for small prey, and their anatomy and phisiology tells us what they are intended to eat. what did dogs 1,000 years ago eat...flavored biscuits with synthetic vitamins and flavorings sprayed on them? NO. When the body doesn't get the proper nutrition it begins to be out of balance. When your dog eats kibble, any brand, any "quality", the immune system sees it as an invader and attacks, part of this process is the release of chemicals called histamines. What happens when histamines are released in the body? Inflammation. This acute, low grade reaction becomes chronic over time. Chronic inflammation can lead to issues such as cancer, arthritis, or gastritis. The diet of our dogs affects more than just their gut. 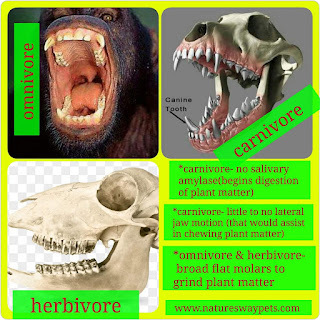 A proper meaty bone diet keeps the teeth clean, gums healthy, and provides mental stimulation. As you can see the Nutrition affects the whole dog. All animals must have exersize that is appropriate for the species and for their specific self. In the wild a dog may have to travel miles to find food or mates, they may have to run at top speeds for short distances to catch prey. But are not moving all day long like a horse. They spend about half of their day sleeping! Appropriate exersize means appropriate for the age and physical condition of a specific dog, but not too much or injury or exhaustion can result. Appropriate movement for your dog will provide mental stimulation, burn calories and pump lymph around the body. Exersize will burn energy which could otherwise be used in inappropriate activities like chewing up your couch. For puppies you will need to provide short walks and opportunities for your pup to romp in the yard throughout the day. Exersize as a law of health does not just mean the physical, it also means the mental. Your puppy/dog needs mental stimulation. This can be short training sessions or things like brain games and complicated recreational bones. All living beings need water to survive. Water should be pure and clean, free from toxins like chlorine and fluoride. Your dog is made up of about 70% water and water is the main ingredient in healthy living cells. Water carries nutrients to cells, aids digestion and is used to flush toxins, it lubricates joints and helps cool the body. As you can see pure clean water is needed in every aspect of your dog's health. Make sure your dog's water bowl is kept clean and the water is changed at least once per day. The bowl should be washed with soap and water every few days to weekly as needed. Be sure your dogs water is out of direct sunlight and away from drafts. A heavy flat bottom glass or food-safe ceramic bowl works great and is free from leaching contaminants. Dogs know instinctively that they need sunshine. Have you seen a dog laying in a shaft of sunlight coming through a window? While they don't need full sun all day long, they do need the opportunity to sun themselves. A dog will lay out in the sunshine for a time then move to the shade as needed. It may be bitterly cold or scorching hot but your dog(and you) still need to spend a time in the sunshine. Unfortunately in our modern times our soils are depleted, making our food less nutrient rich. We all know there are no guarantees in life and Natural Rearing cannot guarantee a disease free life. We are continually exposed to toxins in our air, foods, and man made items like our very homes, cleaning products, vehicles and furniture. In this modern world imbalances happen. Supplements are needed to bridge this gap and help us balance things out. The most common supplements you should be aware of are Probiotics, Digestive Enzymes, Colostrum and Herbs. Some people describe temperance as total abstinence, and some think of it as license to do whatever they want as long as it is in moderation. I think it is somewhere in between. This quote sums it up well. "Temperance is moderation in the things that are good, and total abstinence in the things that are foul" -Francis E Willard. Water is good for us but one can still die from water intoxication. Also, while the theory is noble, vaccines contain some very foul ingredients indeed(aluminum, thiomersal, and foreign DNA) so even one vaccine can cause adverse reactions that linger for a lifetime and can even cause death. So Moderation in the good, abstinence in the corrupt. Your dog needs fresh air daily. While she will get some on daily walks, be cognizant of the air in your home as well. If you have to leave your dog at home for long periods of time, consider a doggie-door to a contained area outdoors or cracking a window to allow fresh air to flow through the house. Another thing to consider is the products you use in your home such as air fresheners, cleaners and candles. Many of these products contain unsafe ingredients that are breathed in and can build up in your dog's system and cause breathing, eye, ear or skin problems, even cancer. We all need good rest, but dogs have different sleep cycles than humans, with shorter and less periods of REM sleep. On average dogs sleep about 12-14 hours a day and puppies sleep 18-20 hours per day! Rest is needed for rejuvenation of the body, and restoration of the mind. Your dog may prefer to sleep with you at night or not, but it is important to give your dog a space of their own to rest that is dark, quiet and free from Electrical Magnetic Frequencies. So right beside your TV or refrigerator may not be the ideal spot. A covered crate in an out of the way spot is a good safe place for them to rest and relax. This is not a thing we often think of when we think about health, but it is very important. The definition of Trust is the "firm belief in the reliability, truth, ability or strength of something or someone". A synonym for trust is confidence. We need to have trust in the laws of health listed here. These laws are our way to health and a quality life. If we lose confidence in the nutrition for example and switch to feeding kibble, our dog will become unbalanced and eventually chronically unhealthy. Sometimes this happens when we don't have a complete understanding of one of these Laws of Health. If this is the case, ask me for more educational support. Have faith, stand firm, if you need support or guidance, that is what I am here for you for! Your precious pup is depending on you, and I am trusting you to continue what I have just begun with your pup.